When it comes to planning for a long weekend in Rome, Italy, there are certain things that absolutely have to be on the list; from the famed sites of Ancient Rome to the electrifying atmosphere of the Stadio Olimpico, there's a lot to pack into 72 hours. Excitingly, there are a whole lot of lesser known gems that deserve your attention too, including secret speakeasys, terrifying bone crypts and ancient libraries. So, featuring everything you need to do, see, eat and discover during your time in the Eternal City, here's a guide to how to really live the "when in Rome" mantra to the max. Rome has two international airports, and is well-served by airlines from across Europe and beyond; generally budget airlines fly into Rome Ciampino and others into Rome Fiumicino, although Easyjet also use this latter airport. A transfer from Ciampino to the city centre will set you back around €50, despite it being just 7.5 miles away, so it may be best to jump aboard one of the many coach services that run this route for less than €10 per person. From Fiumicino to Rome there is an airport train that runs every 15 minutes. It's actually a very walkable city, but if those hills do get too much for you then you will need to buy a (fortunately very cheap) public transport ticket. These are valid across all of the city's bus, tram and metro lines, and can be bought to last 100 minutes, or for longer periods of 24, 48 or 72 hours. A seven day ticket is also available, if you're lucky enough to be spending a week in Rome. To be honest, this depends entirely on what you're looking for. The summer season can be crowded and prices for flights and hotels will be higher, but you will get to enjoy the warm weather, bask in the sunshine, indulge in alfresco dinners and sit out drinking wine until late in the evening. In the winter it's a different story - it's cheaper and quieter, meaning you'll find the big attractions less crowded, but it's also chillier, sometimes experiencing snow. That said, it has its fair share of Christmas markets, and the ancient backdrop makes them all the more magical. 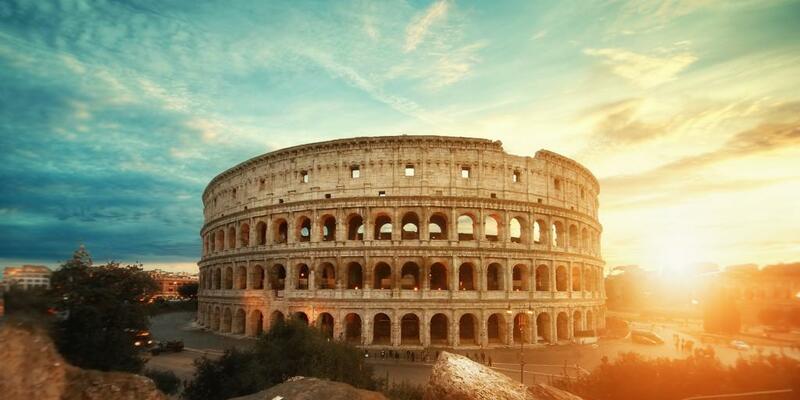 Starting the day with a couple of big hitters, you'll spend the morning exploring some of the most famous sights of Ancient Rome in the Colosseo district. First things first though, order yourself a coffee from one of the city's many coffee bars - you've been up for a while, after all. Don't expect anything frothy or resembling dirty dishwater though - no, coffee is more or less an sacred art form here and it's served short, sharp and strong. Fear not, this pitstop won't take long - you don't sip this coffee, you shot it. Now, let's get moving. We know you're desperate to snap that selfie in front of the Colosseum, but our very first stop of the day is actually its near-neighbour, Palatine Hill. One of the Seven Hills of Rome - the hills upon which Ancient Rome was built - it is where the most affluent and powerful people in the land once lived, and where the secret deals of the day would have been done. Among the highlights here is the House of Augustus, which contains bright frescoes and mosaic floors. Oh, and there's also a sneaky second reason you're here first: your ticket also admits you to the Roman Forum and the Colosseum, both of which will have much longer queues. Alternatively, you can buy it online before you arrive. 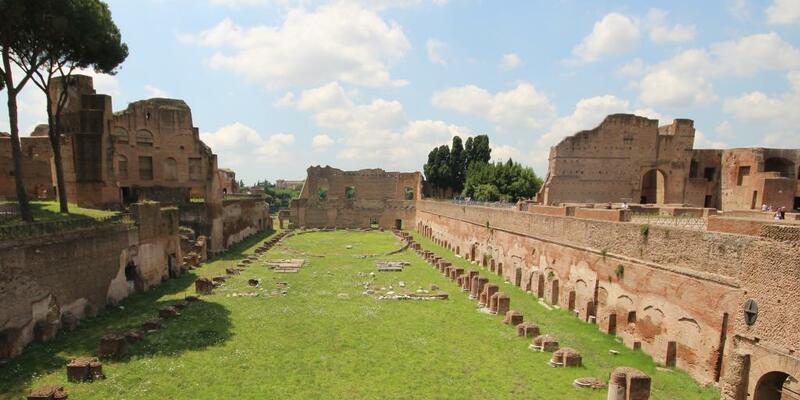 Once you're done at Palatine Hill, make your way down to the Roman Forum - which you'll have seen from above - to walk around and learn about the area that was at the heart of public life in Ancient Rome. It is around this now-ruinous plaza that most of the various government offices would have sat, including the Senate, while the square itself was used as a marketplace, a centre for grand speeches and, rather more ghoulishly, to execute criminals. Now, it's onward to the jewel in the crown of Ancient Rome and a must-see on any Rome city break: the Colosseum. One of the New 7 Wonders of the World, it's almost 2000 years old and to this day the largest amphitheatre ever built, capable in its prime of seating around 80,000 spectators. 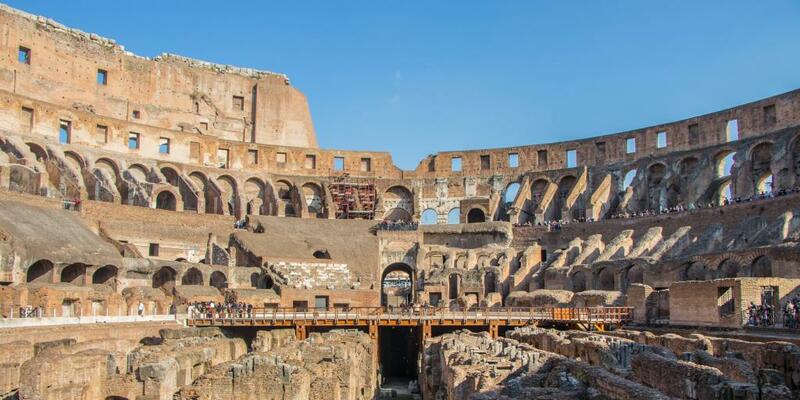 Most famous for hosting gruesome gladiatorial battles, it has also been used as everything from a settlement to a cemetery; today, it attracts over four million visitors every single year, and while normally we'd say this is a turn off, this time it's worth it. With all that walking, you've most likely worked up quite the appetite, so now seems like a sensible time to stop for a bit of grub. On Via di S. Giovanni there's a humble snack stop with a funny name, Goloseum, that offers pasta, paninis and salads to go. Grab something tasty and wander across to the nearby Parco di Colle Oppio for lunch in the sun. Once you're full of food it's time to head away from the Colosseum area and towards another of the Seven Hills of Rome, Aventine Hill, by roughly following Via Celio Vibenna. As you walk, you'll pass the ruins of of Circus Maximus, an Ancient Roman chariot racing stadium, and if you fancy adding a bit more walking then carry on down to the Pyramid of Cestius, an ancient pyramid built as a tomb for Gaius Cestius that now sits alongside a (rather unpeaceful) busy road. If you do go this far down, then reward yourself by calling into Il Gelato di Claudio Torce, which is located about halfway between the two and is the go-to gelateria in this area. Be sure to try one of their more quirky flavours, such as 'Ricotta, Sambuca and Coffee' or 'Cream of Pepperoni'. Your next challenge is to climb the Aventine Hill - don't worry, it will only take five minutes or so - up to the Priory of the Knights of Malta, the HQ of the Sovereign Order of Malta. 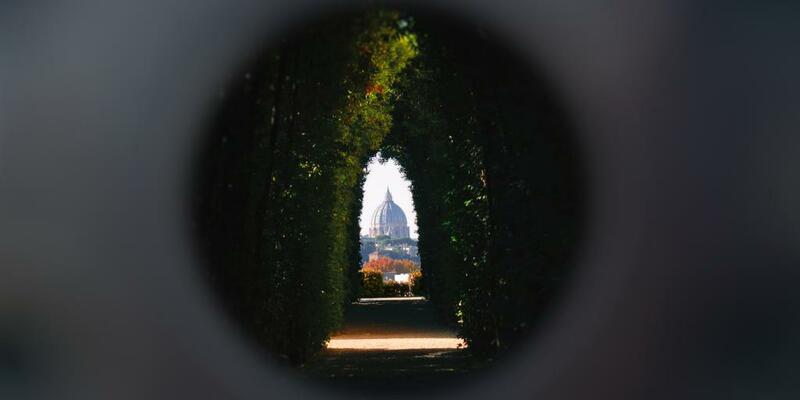 Although you can't go inside the private property itself, peeping through the keyhole on its main gate will afford you one of the most unusual cityscapes in Rome: three countries, perfectly lined up, and your first sighting of the St Peter's basilica. 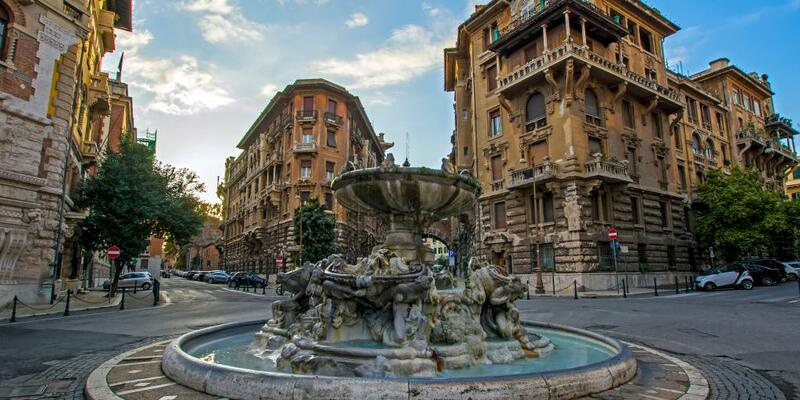 It sounds simple, but trust us when we say that your weekend in Rome would be poorer without it. Next, follow the Via di Santa Sabina along to the huge Rome Rose Garden, which features over 1000 varieties of rose; unfortunately it's only open to the public from April to June, but if you're there during these months it's well worth popping in, even if just for the smell. 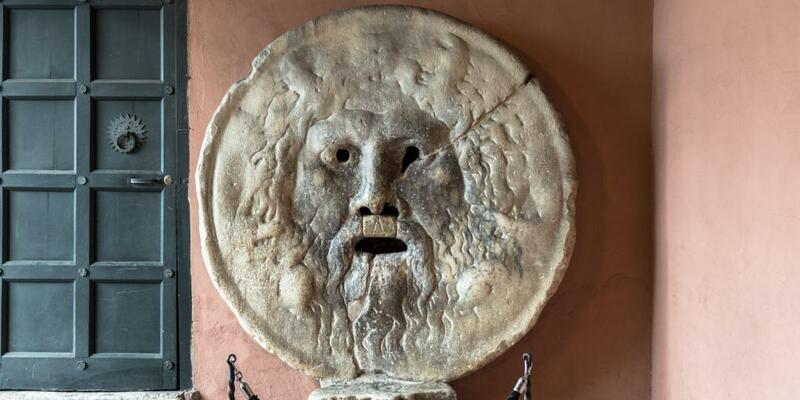 Where you're really aiming for, however, is a more unusual site known as the Bocca della Verità, or in English, the Mouth of Truth. Reputed to have been an Ancient Roman lie detector, legend has it that if you put your hand inside and tell a lie then it will be bitten off. By now, the day will probably be drawing to a close, so it's time to move to somewhere more sociable for a bite to eat and a few glasses of vino - you deserve it after all this walking. Cross the nearby Ponte Palacio into the neighbourhood of Trastevere, which is full of pretty piazzas to sit out in, narrow alleyways to disappear into and surprise sights around almost every corner. Although perhaps slightly more touristy than some other areas, Trastevere offers the biggest selection of restaurants in Rome and has a vibrant nightlife for those post-dinner drinks. For a (big) pre-dinner snack make a beeline for I Pizzicaroli, which offers exceptional mixed meat and cheese boards for an affordable price. For a mouth-watering plate of pasta then Alle Fratte Di Trastevere, a family run and surprisingly untouristy restaurant (which also serves amazing bruschetta) is an excellent choice. Those craving pizza will have their prayers answered by visiting Tonnarello. Start the day by demolishing a delicious Italian breakfast; this will usually consist of either bread and jam or pastries such as a cornetto (no, not the ice cream) which is slightly less sweet than a croissant and has an orange glaze on top. Anyone with a particularly sweet tooth will be pleased to hear that ciambella, which is pretty much a doughnut and cake combined, is also sometimes served for breakfast. Oh, and don't forget the coffee - arguably the most important part. Okay, now you're pumped full of sugar it's time to start exploring once more. This morning's destination is Vatican City; an independent city-state, the home of the Pope and the site at the centre of the Catholic Church, it's a location that even those who aren't religious should not miss during a weekend break in Rome. Despite being the world's smallest country, The Vatican holds one of the world's largest art collections, as well being the location of some of the globe's most recognisable landmarks. Book your admission to the various parts online before you, and even if you don't book ahead then ignore the touts as you arrive, otherwise you'll almost certainly end up paying more. Start the day by visiting The Vatican Museums, but know that with 20,000 exhibits on display across 54 galleries, you'll need to choose what you see wisely - it's up to you whether that means paintings through the ages, Roman and Greek sculptures, Egyptian antiquities, or papal portraits and relics at the Historical Museum. The Sistine Chapel, the legendary ceiling of which was painted by Michelangelo between 1508 and 1512 , is the crowning glory of these museums. 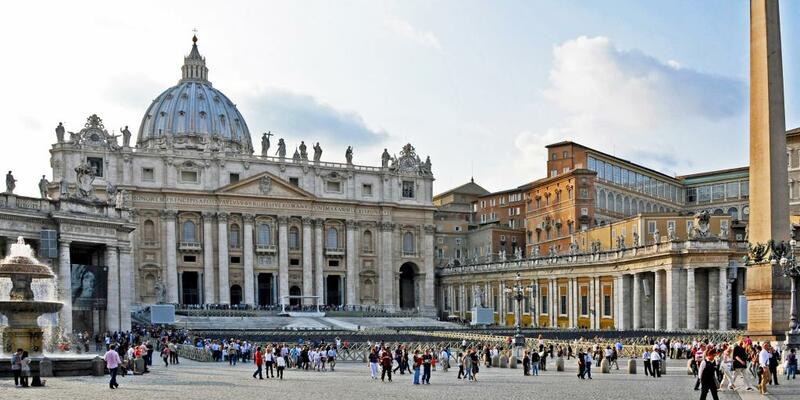 Next, move outside to St Peter's Square, an enormous plaza capable of holding more than 300,000 people that is used as a gathering point, and which leads directly to one of the most important sites in Catholicism, St Peter's Basilica. The basilica is built on the spot where St Peter, one of Jesus' twelve disciples, was buried after being executed in Rome; from here, the Pope presides over services. Inside, visitors can climb to the top of the building's iconic dome, enjoy the artworks on display and admire the intricate architecture. All done at The Vatican? 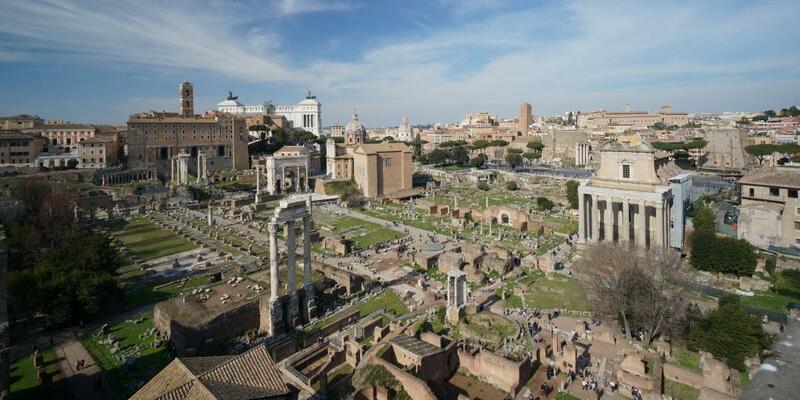 Let's move along towards the Old Rome district for a little more fun with the Ancient Romans. 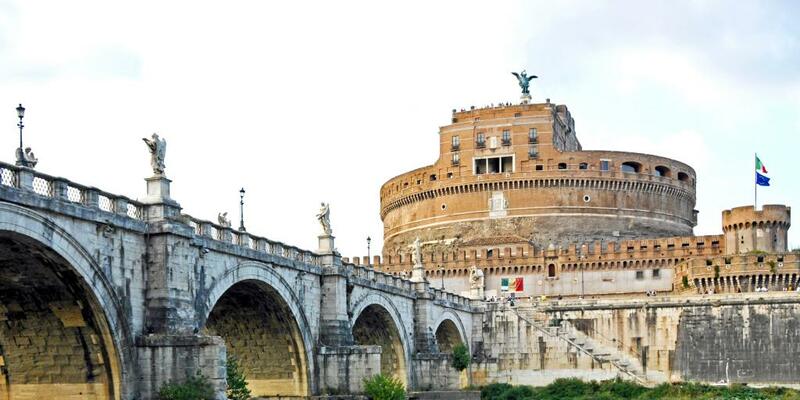 Walk towards the Ponte Sant'Angelo bridge via the Parco Adriano, where you'll also find the Castel Sant'Angelo, a cylindrical structure originally built as a tomb for the emperor Hadrian and now a museum - pop your head in if you wish. Once you're across the river, it's time to find some lunch. Etabli, a shabby-chic eatery set in a beautiful old building located just over half way between the bridge and Piazza Navona (our next stop), is popular with locals and serves out-of-this-world tuna. 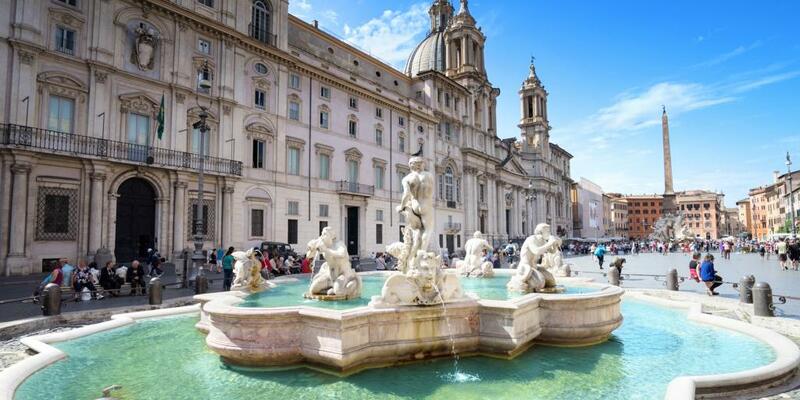 It's onto the colourful Piazza Navona now; built on the site of an old Roman stadium, it's home to three fountains, the most famous being the Fountain of Four Rivers which appears in the film adaptation of Dan Brown's Angels and Demons. Indulge in your first gelato of the day and spend an hour or so just wandering around, people watching and taking it all in, before you move along to the Biblioteca Angelica, just a few streets away. A working library first established in 1604, this bookworm's dreamland holds near 200,000 items and looks like something pulled straight from Hogwarts. Note that you'll need to bring ID to be able to enter and to leave belongings at the reception. 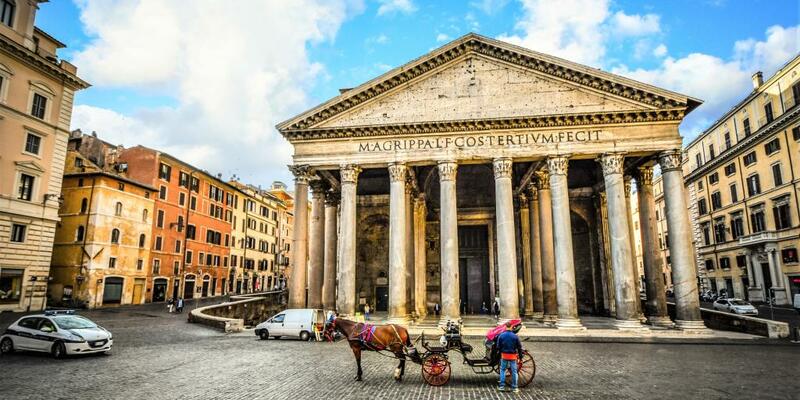 Next up is another must-do on any Rome city break: the Pantheon. The best preserved Ancient Roman building in the whole city, it was built as a temple, although there are varying opinions about when exactly this was. Its most striking feature, its domed roof, remains the largest unreinforced concrete roof in the world and contains an oculus (read: a hole) to let the light in. When it rains, a purpose-built drainage system takes the water away through the floor. And here's another fun fact for you: originally this building would have sat high above the street and been approachable by stairs - it's only equal now because the ground level has risen so much over the course of the last 2000 years. 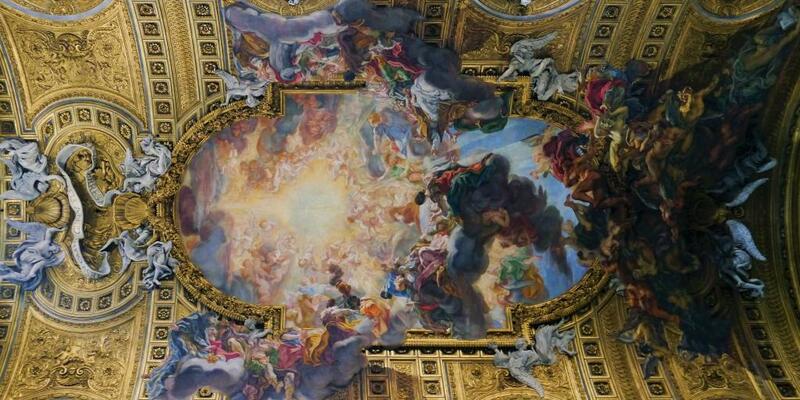 Better than the Sistine Chapel? Fast-forward some 1500 years (plus a short walk) and you'll find yourself at the Chiesa del Gesù, the mother church of the Jesuits, a Catholic religious order. Truly unremarkable from the outside, the inside of the 500 year old church is a spectacle to be seen: lavishly decorated, dripping in gold, and containing stunning ceiling frescoes that some even say rival the Sistine Chapel. Big claim? You'll have to decide for yourself! Dinner on day two calls for something truly local. Our recommendation? Anywhere that serves fried zucchini flowers, a Roman speciality, for starters and spaghetti carbonara for mains. As any Italian will tell you, true carbonara - the kind that's not creamy - is from Rome. Make it a three course feast by tucking into some tiramisu or your second gelato of the day. You're not totally done sightseeing for the day though, because a post-dinner stroll to the Trevi Fountain is called for. Said to bring you luck if you throw coins into the water over your left shoulder, using your right hand, it's estimated that a mindblowing €3,000 is thrown in every single day (yes, day) by wishful visitors. 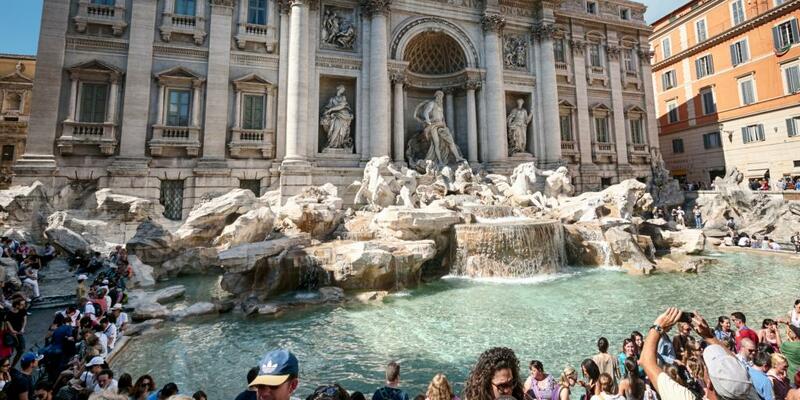 It's illegal to steal coins from the fountain, and they are collected weekly and given to charity. Afterwards, stop off for a glass of wine or a cold lager, just because you can. Alternatively, you could spend the evening catching a local football match at the Stadio Olimpico, one of the most historic football stadiums still in use, and home to both AS Roma and their arch-rivals, Lazio. Italians are very, very passionate their football, and whoever you choose to see it's almost guaranteed that the atmosphere will be buzzing. Just do yourself a favour, and stay away from the stands where the Ultra fans sit - they don't have a very good reputation. Regardless of whether you've chosen the fountain or the football, grab a nightcap in a chilled out speakeasy bar. You'll need to book ahead to visit many of them, but the quality of these inconspicuous cocktail bars is generally exceptional. If you can't get a booking then head back to Trastevere and seek out the quirky chocolate shots of Cioccolata e Vino or the talented mixologists at Freni e Frizioni. Okay so your stay in the Eternal City is drawing to an end and there's no time to waste, so ask your hotel to store your bags for the day then choose a cafe in which to devour your final scrumptious Italian breakfast of your holiday to Rome. Today, take your coffee with crostano - a breakfast tart with a devilishly buttery crust that's filled with fruity jam. Everything you'll be doing today is short and sweet, so no need to rush it. Satisfied? Brilliant. Now jump in a taxi to the Quartiere Coppedè, in the North of the city. Totally different to the rest of the city, there's nothing shy or subtle about this neighbourhood with its mish-mash of gaudy architecture, bright houses and brash patterns. Legend has it that the Beatles jumped into the Fountain of the Frogs, the area's central spot, after playing a gig nearby. Pop culture cravings fulfilled, take a wander across to the Museo e Galleria Borghese. Set in expansive gardens, this art museum houses numerous treasures, mostly from the 15th to 18th centuries, as well as a number of Ancient Roman antiquities. Small but perfectly formed, compared to some of the city's other mammoth collections, the Galleria Borghese only admits people in set sessions lasting two hours. When you're done, walk through its gardens to the Porta Pinciana exit, ready for the next stop on our tour of Rome. Follow the Via Vittorio Veneto away from the gardens and down until you get to Museum and Crypt of the Capuchin Friars (resist the temptation to stop off at the Hard Rock Cafe - there's far better food coming soon). A series of small chapels hidden beneath the Santa Maria della Concezione dei Cappuccini church, they are decorated using the bones of almost 4,000 deceased friars, with bone-ornaments and even mummified monks adorning the walls. One not to be missed, they're macabre as can be and yet surprisingly peaceful. Once you're back above ground, nip across the road to Fraschetteria Giampiccolo for lunch; even if the crypt has put you off the idea of food, it won't take long for this place to revive your appetite. Serving up fresh and simple food in generous portions, their cheese laden platters and well-stuffed sandwiches are particularly yummy. 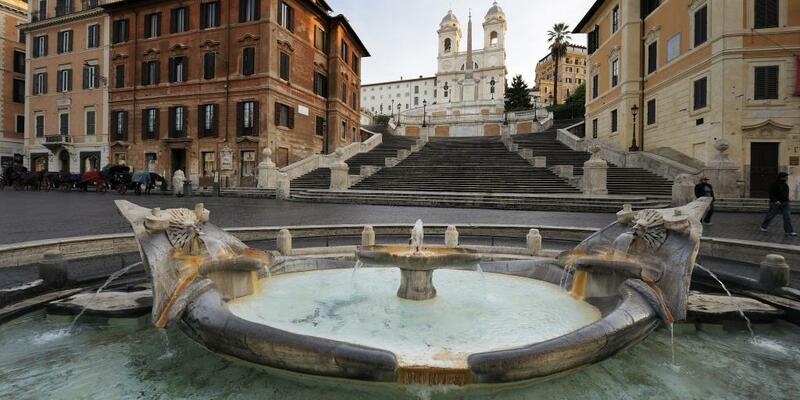 Now, it's time to walk onwards and you're heading for one of the most famous squares in Rome, the Piazza di Spagna. Lined with posh boutiques and big old buildings that exude that kind-of-fading-now charm, it's a great place for a stroll around with an ice cream. However, the piazza's real focal point is the Spanish Steps, a flight of 135 stairs that links it with the Piazza Trinità dei Monti at the top. Built in 1723, they are said to have inspired countless artists and writers. At their foot sits the Fontana della Barcaccia, which is designed to resemble a half-sunken ship; although some say that this water is clean enough to drink, to do so is entirely at your own risk. In the corner of the square (and once within earshot of the fountain) you will find the former home of English poet John Keats, one of the key figures of the Romantic movement - it was in this building, in 1821, that he passed away. Today, it has been turned into a museum about his life and that of his friend and fellow poet, Percy Bysshe Shelley, who also lived and is memorialised in the city. Entry is €5 for adults and it makes for a very interesting way to spend an hour or so. Your last night of any city break deserves a slap up meal, and Ad Hoc, located on the nearby Via di Ripetta, will certainly sort this out for you. Their tasting menu, which is impeccably paired with wines, is legendary. Stroll back to the piazza for one final drink on the cobbles then wizz back to your hotel, pick up your bags and catch a late flight home. We hope you've had a great weekend in Rome!